HRV: What the heck is it? A heat recovery ventilator is a mechanical ventilation system, which recovers a percentage of the heat from inside a structure as it is replacing a percentage of the indoor stale air with fresh air. These systems can also be called air exchangers, air-to-air heat exchangers, or MVHRs. As stale indoor air passes through the unit on it's way to the outdoors, it passes by a heat exchanger, which makes a heat transfer to the incoming supply fresh air. Hence, it's name. The heat recovery ventilator saves energy by reducing a heating system's run-time to reheat the cold ventilation air being introduced into the structure. ERVs or energy recovery ventilators are very similar in both construction and function. An ERV, however, also transfers the humidity from the outbound air stream to the inbound air stream. An HRV or ERV can be installed as an integral component of a forced air system for whole-house ventilation, or it can be installed as a stand-alone unit for spot ventilation, such as a home theater or exercise area. Homes today are being built tighter and tighter, which limits natural infiltration. The air inside a home can become stale. Opening a window will provide the ventilation needed, but then the structure's heating or air conditioning system must compensate, destroying efficiency. A heat recovery ventilator provides the best solution: fresh air introduction, better climate control, and energy efficiency. Lesser efficient heat recovery ventilators are estimated at 60% to 70% efficient, while upper end units boast 70% to 85% efficiency. Efficiencies for Heat recovery ventilators are increasing by leaps and bounds. As manufacturers develop better heat exchangers, more efficient heat recovery ventilators follow closely behind. It is recommended that today's homes be provided with 15 cfm (cubic feet per minute) of fresh air per occupant. A good "rule of thumb" is to take the number of bedrooms plus 1 for the occupant number. Figure up your home's square footage. Home length x home width. Figure up your home's air volume, or cubic feet. This is your square footage x ceiling height. Then divide your home's cubic feet by the HRVs capacity to determine if your ventilation is sufficient. A 3 bedroom home + 1 = 4 occupants. 4 occupants x 15 cfm = 60 cfm of ventilation recommended. Our 3 bedroom example home has 2000 square feet (length x width) with 8' ceilings. 2000 x 8 = 16,000 cubic feet. 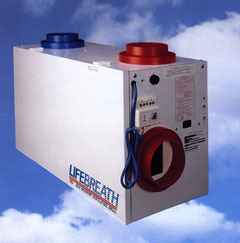 Our HRV provides 200 cfm. 16,000 cfm divided by 200 cfm = 80 cubic feet per minute of fresh air being supplied into the residence. We only need 60 cfm, so this heat recovery ventilator is sufficient for this example home.